If all is right with the world this morning, I’ll be running my 8th half marathon at 9am in the southwest region of New York. I’m looking forward to the race itself, but even more so to the drive to and from Jamestown, which is sure to be full of beautiful fall colors. Let’s talk about getting back to nature. What do I mean by that? Your spending freeze may or may not have included money spent on entertainment, but I’d encourage you, no matter your guidelines, to spend some more time outside during these last 18 days of your freeze. First, depending on where you live in this amazing world, fall can be the most beautiful time of year. Second, being outside is FREE. Grab the kids, the dogs, a football or a frisbee and head to your favorite local park or even just the back yard. Find a new trail to hike or a visit an area that you usually only head to in the summer. Ohio’s beaches are still gorgeous in the fall, but most people skip them once we get a cool breeze. What better time to have a beach to yourself? 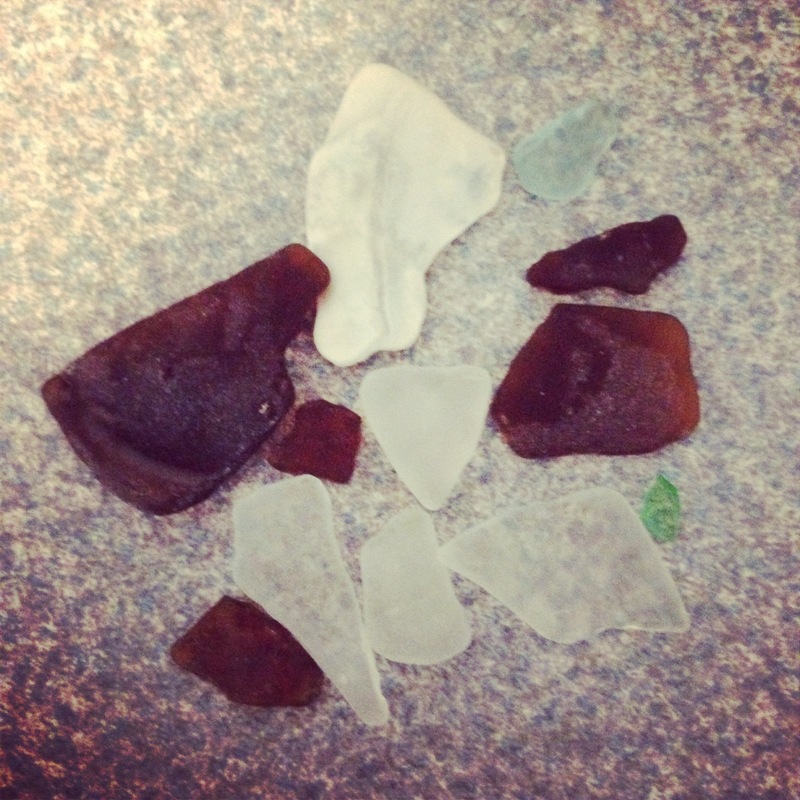 Beach glass from the Lake Erie shores – we treasure hunt through the sand to find it! Pack water & snacks – save yourself from spending on emergency drinks at the park or at a convenience store afterwards. Get off the beaten path, but not without sunscreen and bug spray. Safety first! Variety is the spice of life – find a new place to visit each week if possible, enlisting friends and family to point you to places you can check out. Take photos! Our local parks system is often running a photo contest as a promotion and will offer a prize for winning photos. Ham it up and make some memories for your photo album or scrap-book. 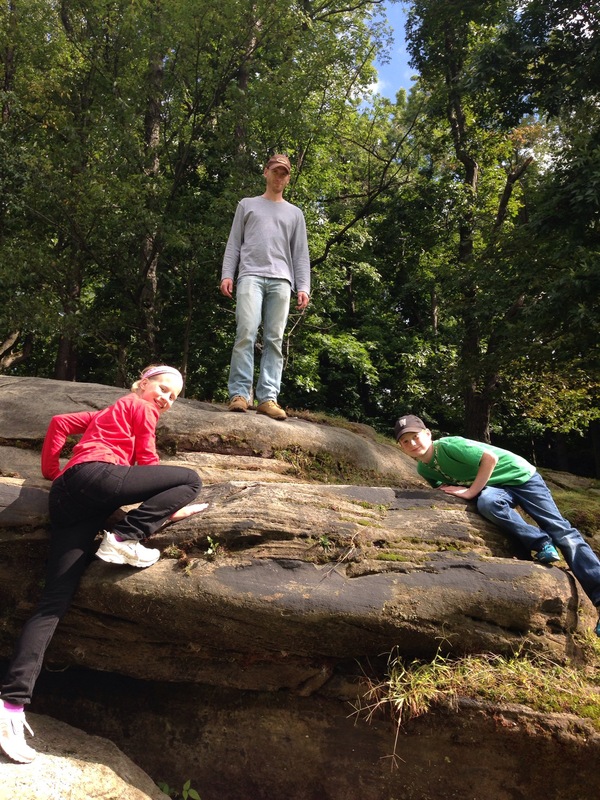 Here’s my crew exploring a newer park in our area – a former golf course that is being returned to nature! Enjoy exploring! Have a beautiful Sunday!